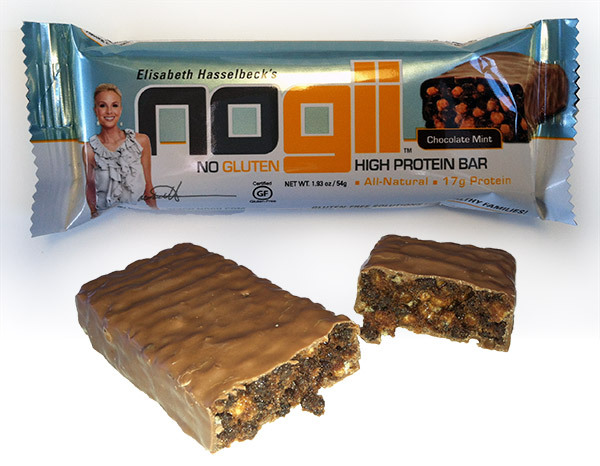 The NoGii High Protein Bar Peanut Butter & Chocolate contains 20 grams of high quality protein. 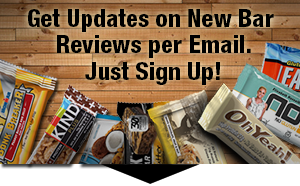 Perfect for a quick on-the-go meal or to refuel after a workout, these tasty bars are just the right fit for your nutritional gluten-free food choice. INGREDIENTS: Soy Protein Crisps (Non-GMO Soy Protein Isolate, Tapioca Starch, Salt), Organic Tapioca Syrup, Unsalted Peanut Butter, Milk Chocolate Flavored Coating [Sugar, Palm Kernel Oil, Nonfat Dry Milk Solids, Cocoa Powder, Soy Lecithin (emulsifier), Salt, Natural Flavor], Milk Protein Isolate, Organic Agave Syrup, Vegetable Glycerine, Peanut Flour, Pure Water, Arabic Gum, Natural Flavors, Sea Salt. Allergens: Contains Peanuts, Soy and Milk. 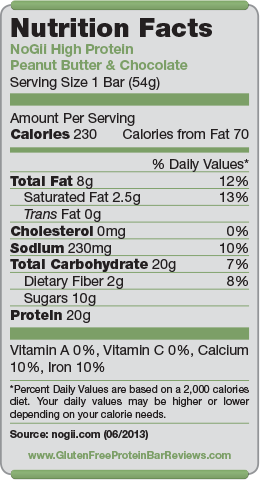 Nutrition facts based on Peanut Butter & Chocolate flavor. Facts and ingredients vary by flavor. Flavors Chocolate Mint and Chocolate Coconut have only 17g of Protein. Everybody loved the taste and had only good things to say about it. Some were even surprised that a protein bar can taste that good. The nice and crunchy texture doesn’t make you feel like you’re eating a protein bar due to lots of soy protein crisps. Contains Palm Kernel Oil, which is a cheaper alternative to cocoa butter and was the main complaint of lower star reviews besides the price. Sugar is a little high for some buyers. The price was the number 1 complaint of the reviews we read. 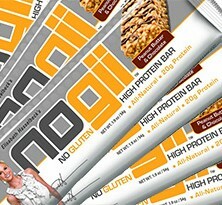 With $2.99 per bar at retail it definitely is above average and buyers probably got a lower price and still complained. However, looking at the price per gram of protein the High Protein Bar is actually right in mid-field in this category. Love the Chocolate Mint flavor!!! 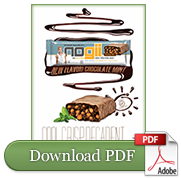 NoGii bars are filling and great for when you’re on-the-go! I can eat half a bar at 3 p.m. and be held over until after my evening workout!